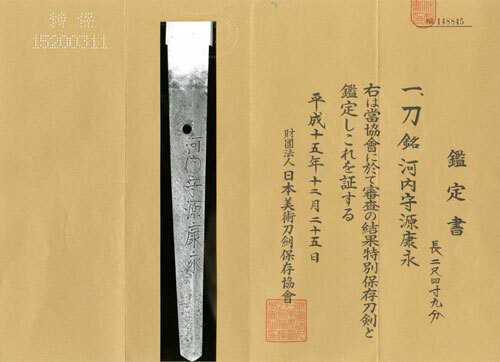 Blade construction: The nagasa measures as long as 75.6cm and blade tapers a bit on the stronger side, having a shallow Sori and ending in a medium Chu-kissaki referred to as Kanbun-shinto-sugata. Kasane is thick measures 7.6mm on base holding massive volume of Hiraniku and being very solid in the hands. Forging (Hada): Kitae is Ko-Itame-hada. The entire skin of Hiraji shows sparkling martensite crystals of Ji-nie that gives off a diffused reflection of Midare-Utsuri. Temper (Hamon): Hamon of visible hardening pattern starts with Osaka-Yakidashi, undulating large clove, tassel-shaped Choji-midare. Hamon is a bit on stronger side Ko-Nie based and boundary line is accumulated with covered with sparkling martensite crystals. The interior is filled in of mist-like Nioi. Thick lines of Ashi feet frequently activates toward the cutting edge, white clouds of YOU or short line of Sunagashi and thick, long lines of Kinsen appear here and there. The entire hamon is rich in activity with sparkling Nie and misty Nioi. Temper of tip (Boshi): Hamon of Boshi in Omote becomes Midarekomi irregular lines with Hakikake and Kinsen lines. Ura side is straight medium circle turns back. Tang (Nakago): UBU in original. One mekugi-ana retaining hole. Ō-sujikai greatly slanting left filemarks. Iriyama V-shape heel. Back ridge is a bit contour outline with Ō-sujikai filemark. 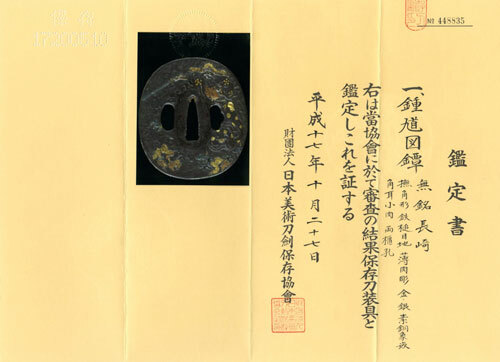 The signature on Hakiomote starts with an official title of Kawachi-no-kami 河内守, name of clan Minamoto 源 and the name of smith YASUNAGA 康永. Smith YASUNAGA 康永 with a title of Kawachi-no-kami 河内守, who was natively born in Kishu province (now Wakayama prefecture) had left for Osaka accompanied by his father of 1st smith YASUHIRO 康廣 and elder brother 2nd YASUHIRO 康廣 during Kanbun era (1661-) to establish Osaka-Ishido school 大坂石堂派. His flamboyant hamon and fine Ko-itame with clear reflection of Utsuri received great acclaim and brought fame as Superior Made of Bizen tradition. He has produced a greatly talented pupil and above superior smith Tatara NAGAYUKI 多々良長幸 who has great renown for the Most Supreme Sharp Saijo-Owaza-Mono cutting performance. This custom-made katana measures as long as 2-shaku 4-sun 9-bu (75.6cm) for cutting edge. Hamon of boundary line starts with Osaka-style Yakidashi and flamboyant Choji-midare of his specialty. Sparkling reflection of Midare-Utsuri is clearly perceived on Hiraji surface. 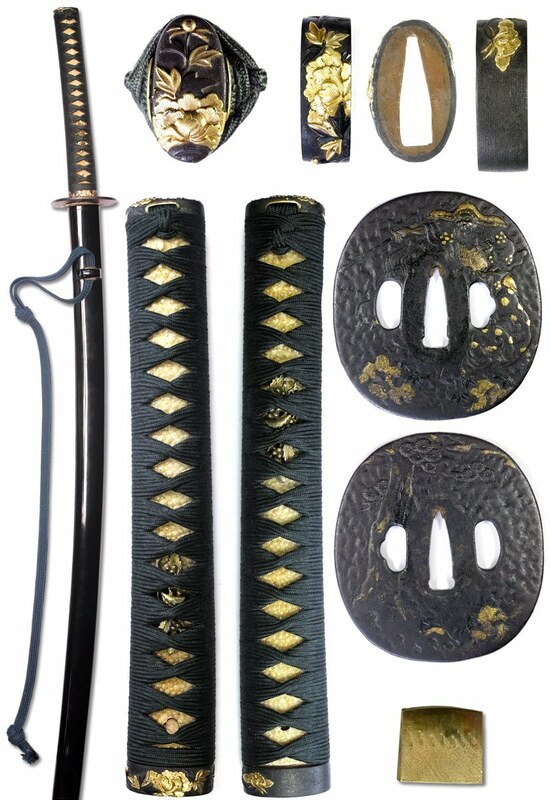 This is the superb katana that shows his real ability of Bizen-den tradition.